Asian stocks traded mixed as China hit back against the Trump administration’s latest tariffs and tensions ratcheted up between the U.S. and Russia. The yen edged higher, while oil held on to its losses. Shares fell in Japan and South Korea, fluctuated in Hong Kong, and pushed higher in China and Australia. Treasuries added to gains made as investors scooped up a record $26 billion 10-year auction. The kiwi tumbled to a two-year low after the New Zealand central bank pushed out its forecast for a rate increase by a year as the outlook for economic growth weakens. China said it will impose 25 percent tariffs on an additional $16 billion worth of imports from the U.S. from Aug. 23, matching Washington’s latest move in the trade war. Separately, the U.S. announced new sanctions on Russia, saying it’s made a final determination that Moscow was responsible for the March 4 nerve-agent attack on former double agent Sergei Skripal in the U.K. The ruble tumbled. Elsewhere, Turkey’s lira nudged higher as a Turkish delegation met with U.S. State Department and Treasury officials in Washington Wednesday, as both sides sought a way out of a deepening feud. Crude traded around a seven-week low as the escalating trade dispute between the world’s biggest economies overshadowed a decline in U.S. crude stockpiles. Bitcoin dropped, leading a sell-off in digital coins of all sizes. Samsung Electronics is set to unveil its next Galaxy Note smartphone on Thursday. U.S. consumer prices probably rose in July from June, consistent with a pickup in inflation that’s projected to keep the Federal Reserve on a path of gradual interest-rate increases, economists forecast before Friday’s release. Japan’s Topix index fell 0.4 percent as of 10:37 a.m. in Tokyo. South Korea’s Kospi index slipped 0.2 percent. Hong Kong’s Hang Seng Index declined 0.4 percent. The Shanghai Composite Index fell 0.3 percent. The MSCI Asia Pacific Index lost 0.2 percent. The yen rose 0.2 percent to 110.81 per dollar. The offshore yuan fell 0.2 percent to 6.8359 per dollar. The kiwi plunged 1.2 percent to 66.68 U.S. cents. The Bloomberg Dollar Spot Index edged less than 0.1 percent higher. 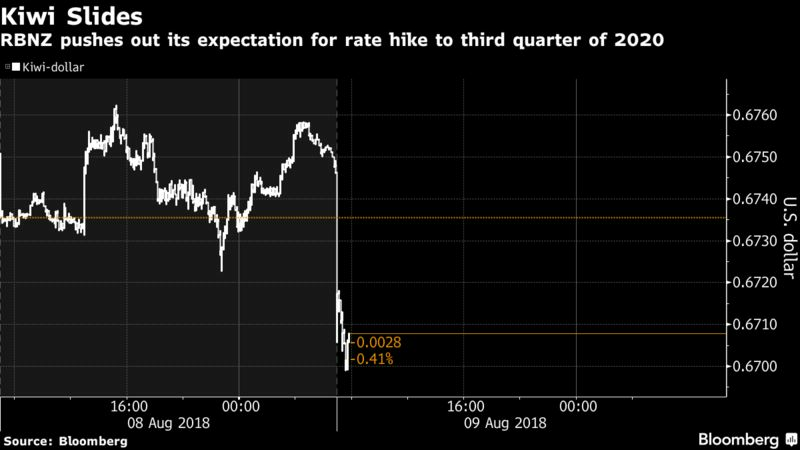 The yield on 10-year Treasuries nudged one basis point lower to 2.95 percent. Australia’s 10-year bond yield fell about 3 basis points to 2.64 percent. West Texas Intermediate crude slid 0.1 percent to $66.86 a barrel, after slumping 3.2 percent. Gold was little changed at $1,212.50 an ounce.